The Sugar Hill Inn Bed and Breakfast, well known for its romantic touches, fine dining, original art, and stylish guest rooms and cottages, is dedicated to providing you the best lodging experience in New Hampshire. It is a luxury Inn designed for vacationing couples and individuals who are seeking a secluded and romantic mountain hideaway. While here, surround yourself in the splendid natural beauty of New Hampshire’s picturesque White Mountains, and relish in the restorative time spent at our impeccably restored Inn. 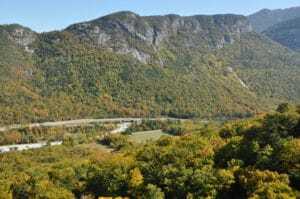 When the urge to venture out strikes, head to Franconia Notch State Park, home of the Cannon Mountain Aerial Tramway, for some of the finest views around. Come see for yourself how it feels to embrace the ultimate in luxury, elegance, and adventure in New Hampshire. Book your room at our romantic Bed and Breakfast in the White Mountains today. The Cannon Mountain Aerial Tramway is an 80-passenger tram that takes visitors to the 4,080-foot summit at the top of Cannon Mountain. It’s the highest lift-accessed point in all of New Hampshire, and was the first aerial tramway operating in the United States. It’s been taking visitors on this scenic journey since 1938. The ride only takes 8 minutes, but delivers you to an incredible vantage point on top of the mountain, from which you can see not only New Hampshire below you, but parts of Maine, Vermont, New York and Canada as well. There are also walking paths, a 360 observation deck, and a cafe at the top, so you can really sit and take in the views. 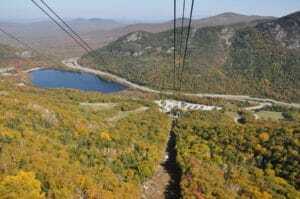 You don’t have to ride the Cannon Mountain Aerial Tramway both directions. Hikers are welcome to take the challenging trek to the top. After you’ve recovered from the journey, a one way ticket will get you a scenic ride back down the mountain. Once you’ve exhausted yourself, the luxurious accommodations at the Sugar Hill Inn will be waiting for you. Book a room at our New Hampshire Bed and Breakfast today.